Since cats are smaller, they are prone to be run over and getting hit by a moving vehicle. To keep your cats safe, consider keeping them indoors with the best cat cages. An indoor cat cage will keep them secure and comfortable inside. Hence, we’ve gathered the best cat cages from the marketplace. From the most stylish to large cat cages, we’ve got everything you need to secure your feline friend and decrease the risks from the danger outside. This spacious indoor cage allows multiple pets for lounging inside all at once. The elegant white finishing will look good in any modern living room or patio. It features 8 and 12 gage white wire with powder coating. You can also choose the color purple and black, depending on what suits your interior design the most. The plastic perches of this cage are adjustable. You can move it to different locations to provide optimal comfort for your feline friends. It has double doors for easy access. The casters are removable. You can attach it to the cage and remove it anytime you want for a robust design. This cage will give your cat an enclosed and safe place to play especially if you are too busy watching over them. This multi-level cat cage is designed for pet owners who own multiple cats. With three levels of platforms to play and lounge, your cats will never get tired playing inside the entire day. It also features four wheels for easy transport. The door latches are engineered an easy-to-twist for hassle-free access. There are door hooks that can prop doors open, allowing your cat to come and go as they wish. You can also open the top of the cage to place anything inside without difficulty. 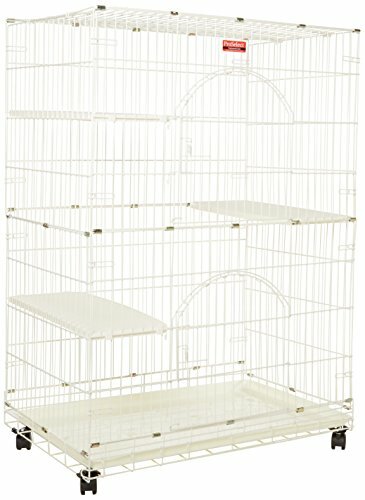 The bottom part of this cage features a removable litter box for an easy clean-up every day. This three-tier cat cage is ideal for groomers, cat shelters, and even boarding homes. The plastic frame that supports the perches of your cat allows them to jump and play just like a cat tree. Thanks to this cat cage, your feline friend will never think of escaping outdoors again. No pet owner can compromise their cat’s safety without their supervision. 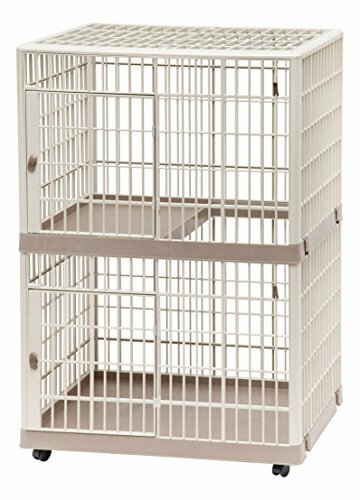 Thanks to the heavy-duty protective cage from Animal House, you need not worry about your kitty’s safe from now on. It’s heavily constructed, allowing you to place in both indoors and outdoors. The quality components of this cat cage can withstand rain and sunlight. It’s the perfect cage if you want to bring your cats outside and protect them at the predators at the same time. 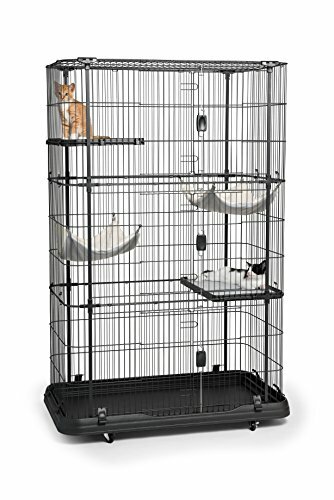 The modular design of this cat cage allows you to make additions or adjustments according to your personal preference. Its free swinging gate provides easy access. 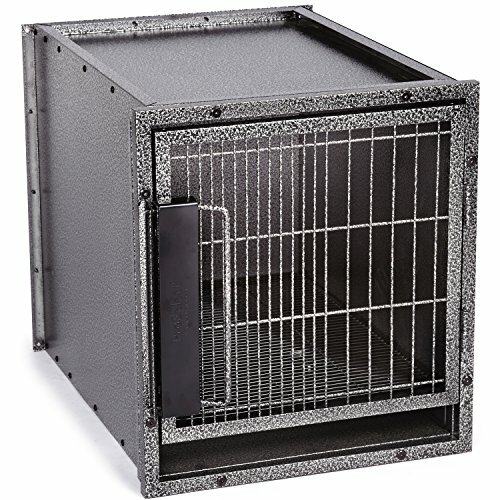 Notice the heavy-duty welded wire panels with powder coat finish designed to protect your cats. Despite the heavy and thick materials, this cat cage is easy to assemble. The package includes all the parts and components you will need. Give your cat the deluxe condo they deserve with this at home from Preveu Pet Products. Thanks to its paw friendly design, there are no gaps or pinch points that might harm your cat if they play recklessly inside. This heavy-duty cat door is rust-resistant. With proper care and maintenance, this model can last for a long time. The aluminum channel construction can ensure the safety of your kitties inside. You only need to spend a few minutes in assembling this cat cage. It is safe to wash with mild soap and warm water. The four levels of this cat cage give plenty of room for your cats to play and lounge. The two-finger locking mechanism makes it easier to access the cage anytime you want. Its contemporary black matte finishing will suit any modern living room you have. This multi-level cat condo provides a generous size for multiple cats to lounge inside. The two-tier cat cage is the solution for pet owners who find it hard to keep their cats inside the house. You can prop open the door using its hooks for hassle-free access. This feature also allows your cat to get out anytime they want so they wouldn’t feel like they’re being trapped. The top part of the cage can be open, allowing you to clean the cage easy. Thanks to its generous size, you can even place a litter box inside and several of your cat’s toys to prevent them from the idea of escaping and going outside. The cage’s slim appearance makes it ideal for pet owners living in apartments or where space is an issue. Now you won’t have to worry about your cat sneaking into the tenant next door again and getting into trouble. Secure your cat inside your house with this YML cat ferret cage. It features two large front doors for easy access, three platforms, and ladders. This cat cage will encourage your feline friends to play and exercise all day. It has a one-inch bar spacing on the body to avoid their paws from getting stuck while playing. The slide-out bottom plastic tray is easy to clean and maintain. Thanks to its black powder coating, it can fit any contemporary interior design you have. It also has wheels that allow you to transport it effortlessly from one place to another. You can remove it afterward to make sure it wouldn’t move even if your cats tend to move around a lot. With lots of rooms to play and lounge, you can train your cat to never escape from the house again. For pet owners looking for a heavy-duty cat cage for their stubborn cats who keep on breaking their cat houses, this one is for you. The Pro Select modular cage graphite is engineered to last for a long time. The endless customization and configuration allow you to be creative and provide optimal comfort for your kitten. You can use this alone or as part of a cage bank, however you like. 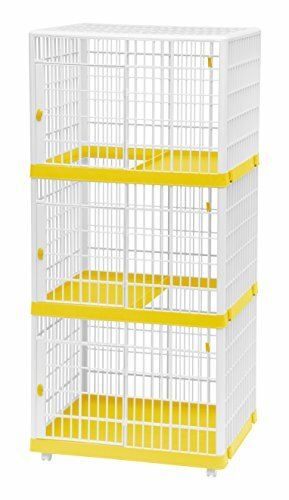 Because of its sturdy construction, you can use this cage in clinics, rescue center, grooming shops, and of course, in household properties. The cage is made of solid zinc-plated 20-gauge steel. Each of the cages features a powder-coated hammertone finish for unmatched durability. You can remove the doors if you want to clean the area. The floor grate and plastic floor tray are removable as well. The package includes a secure latching door and a kennel card holder for easy transportation. 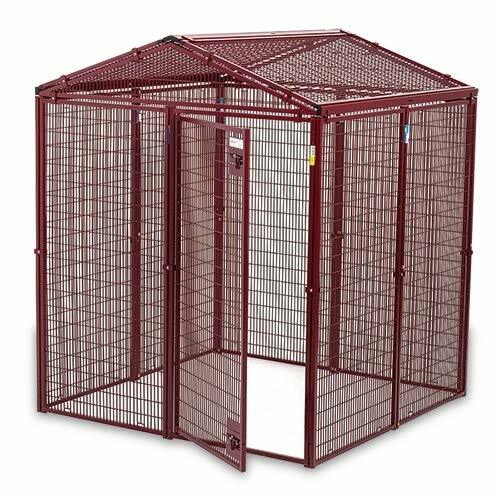 Another product from Animal House is this long-lasting protective pet cage. 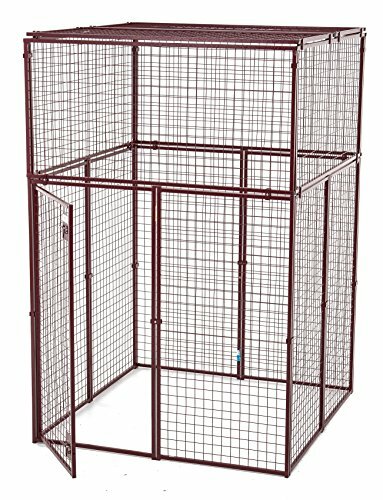 This cage is built to last with quality components that can shield your pets from predators outside. If you want your cats to see the outside world without letting them go, this is the ideal cage for you. Thanks to its modular design, you can make additions or customize it the way you want. Add some levels as much as you want or build a hammock for your active kittens. The free-swinging gate access of this product allows an easy entrance and exit, especially if you’re planning to clean the cage. Notice the heavy-duty welded wire panels with powder coat finish for extreme durability that can withstand everyday outdoor use. Despite the product’s size, it is easy to assemble, requiring only a few minutes of your time. Looking for a deluxe cat condo cage for your little kitty? Check out this four-level animal cage from YML. Its 1.5-inch bar spacing for body ensures the safety of your cats even if they play recklessly inside. The ½-inch bar spacing for floor grate also assures you that your cat’s paw wouldn’t get stuck. There is a bottom plastic tray that can serve as a litter box on the bottom. It’s removable and easy to clean. 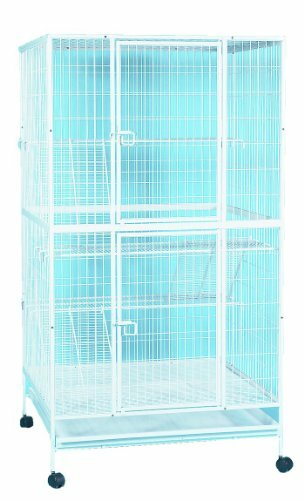 This cat cage features two doors at upper and lower body, allowing you to access your cats inside easily. Thanks to its four platforms, your cat will never run out of space to play and things to do even if you keep them inside the entire day. Its powdery white coating and blue walls blends in any contemporary-designed living room or patio. Crating are for cats and dogs alike. Crating your pet can be an ideal choice for a variety of situations. Albeit most of the time, when crating is conversed, it is usually directed to dogs, but not to cats. If this is your first time buying a cat cage for your pet, below is a buying guide that can help you chose the right cat carrier. 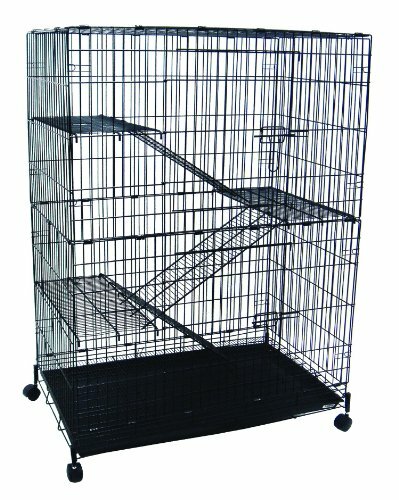 After reading the buying guide, you can proceed to the list of the best cat cages in the market that we have prepared. What is a Cat Cage? Cat cages, similar to other craters, are used for pets for a variety of reasons. While the idea of crating a cat may be new to you, most of the time, kittens are being crated while adult cats are free to roam outside. Cat cage is designed to secure your kitten, to potty train, and of course, to transport your pet from one place to another without the potential harm of the outdoor environment. It makes transportation convenient and comfortable. The first advantage of owning a cat crate is the convenience that it offers when traveling with your pets. If you want to bring your cat to an out-of-town holiday trip or you need to visit the vet, a cat cage is a tremendous help in keeping them safe while inside the car. Chances are, if you leave your cat free inside the running vehicle, they may jump to the passenger window or dirt your vehicle while traveling. It is ideal for potty training. As mentioned above, kittens, not just pups, are being potty trained, too. By using a cat cage, you can discipline your feline into making sure that they develop good potty behavior as they grow. It also helps you to prevent cleaning the unpleasant mess in your living room or bedroom, when your cat cannot go outside to soil. It is ideal for taming wild cats. Supposed you have adopted a cat and you want to tame it, you should consider buying a cat cage first. Feral cats are used to living without a permanent home, and they tend to run off the second they get a chance. Putting them inside a cat cage will help to establish the permanency of their residence in their new environment and helps to build a relationship with your adopted cat in the long run. The first thing that you should consider is the carrier’s size. It should be appropriate for your cat; otherwise, it might cause discomfort and stress to them when they are placed inside. Make sure that your cat can turn around inside the carrier without hitting any of the walls. They should be able to lie down comfortably, and it shouldn’t feel like they are trapped. Another thing that shouldn’t slip off your mind is the cat cage’s construction. It should be well-made and should be able to accommodate your pet without hassle. Most cages are made of cardboard, soft nylon fabric, high-impact plastic, or even metal. Depending on your purpose and the cat that you have, you should be able to determine the appropriate cat cage for your feline. If you wanted a cat cage for transportation purposes, then you should look for a cat cage with a sturdy handle and a set of caster wheels. In that way, it’ll be easier for you to transfer your kitty from one place to another. Also, cat cages that are designed for transportation are made of durable materials that can withstand the harsh elements while on the road. Lastly, check the price of the product. Cat cages aren’t cheap, but you should be able to buy a high-quality cat carrier at an affordable price. But make sure that the price isn’t your major determining factors. Some cat carriers that are sold at a meager price will not last for a long time.